I love having breakfast for dinner. Last night was such a dinner. 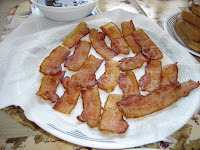 I fried the leftover half package of bacon. 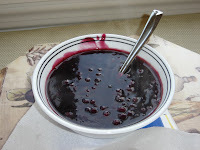 SP came home and made a blueberry 'syrup' - it wasn't a sweet syrup since he didn't add sugar, just cooked some frozen blueberries and added some water/cornstarch to thicken it a bit. 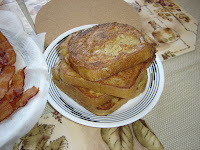 And we made French Toast from the half loaf of organic whole wheat bread we received in the CSA. Yum!! We always add a drop of vanilla and a liberal sprinkling of cinnamon to our egg/milk mixture for extra yummy French Toast.